The list of wildlife in Australia that will haunt your nightmares continues to grow. Pro of living in Australia: The beaches are great. Con of living in Australia: There are sea lice that will apparently eat your skin off. Teenager Sam Kanizay from Melbourne was taken to hospital on Saturday night after he was attacked by the sea bugs, reports Fairfax Media. He went for a quick dip in Brighton's Dendy Street Beach, but emerged from the water to find his legs covered in blood. When the bleeding wouldn't stop, his father Jarrod took him to the hospital. 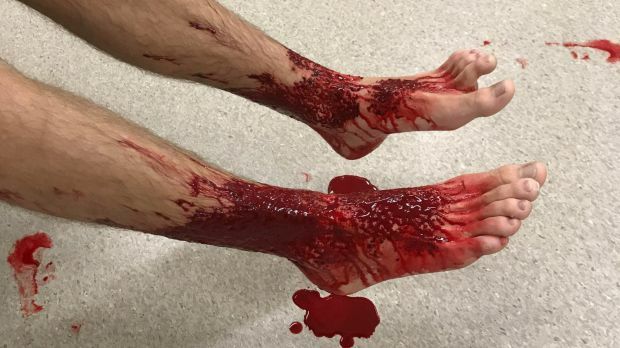 It took almost a day to stop the blood flow -- Sam went to wet his legs at the beach at around 6:30 p.m. on Saturday, and the bleeding stopped on Sunday afternoon, he told Fairfax. You can find a picture of those bloodied-up legs here. Warning: It's intense. The father the next night went back to the beach, with a slab of meat and a fishing net, and caught hundreds of the perps. He's uploaded a sufficiently unsettling video of the sea lice ravaging a steak. After examining some of the caught creatures, scientists at Museums Victoria identified them as lysianassid amphipods. "It was just unlucky," said marine biologist Genefor Walker-Smith. "It's possible he disturbed a feeding group but they are generally not out there waiting to attack like piranhas. "If we didn't have them we would have a sea filled with dead and decaying fish." The story circulated through social media, with Twitter understandably shaken up. Admittedly, it's not great PR for Australia.